Yes, I am very behind in getting this up. I could give you a list of excuses, but that would be boring. I am sure that many of you know that having a home business keeps you pretty darn busy. 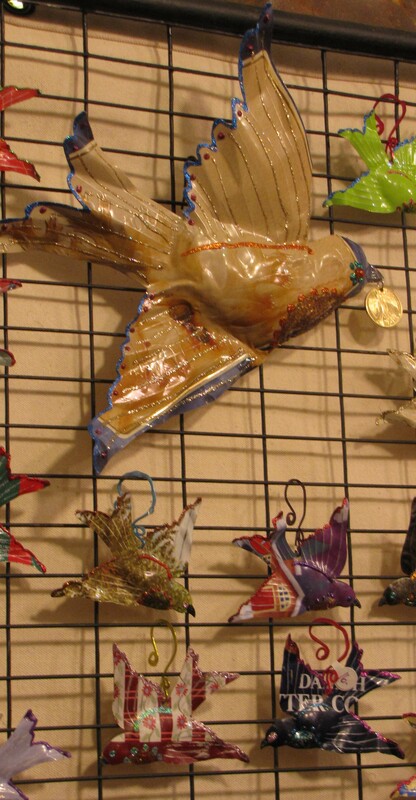 Last November, the Santa Fe Recycle show was quite a treat. In fact, this is my 3rd post on it. Yeah, I had that much fun at this show. You can catch my pictures of the Trash to Fashion Show and also a post on what both my mom and I brought to the show. Big thank you to all the folks at Recycle Santa Fe, including Sarah Pierpoint, for making this such a fun event! Now, what about all the other artists? There were tons, and so very, very talented, and in so many ways. I was a little shy walking around with my big clunky camera. Some booths had it posted asking that there be no photography. So, I only took photos at booths where I talked with the artists and made sure it was OK. People were terribly friendly and enjoyed talking about their art. There was no way I could get around to everyone’s booth, as I was manning our booth half the time. 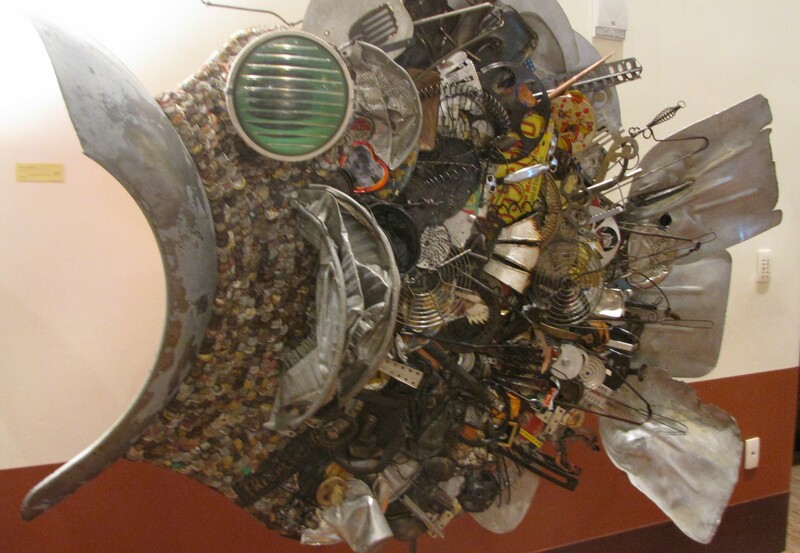 But I hope the following peaks your interest and you can perhaps visit a future Recycle Santa Fe Show. What follows are lots and lots of photos and the artists’ contact info. Enjoy! 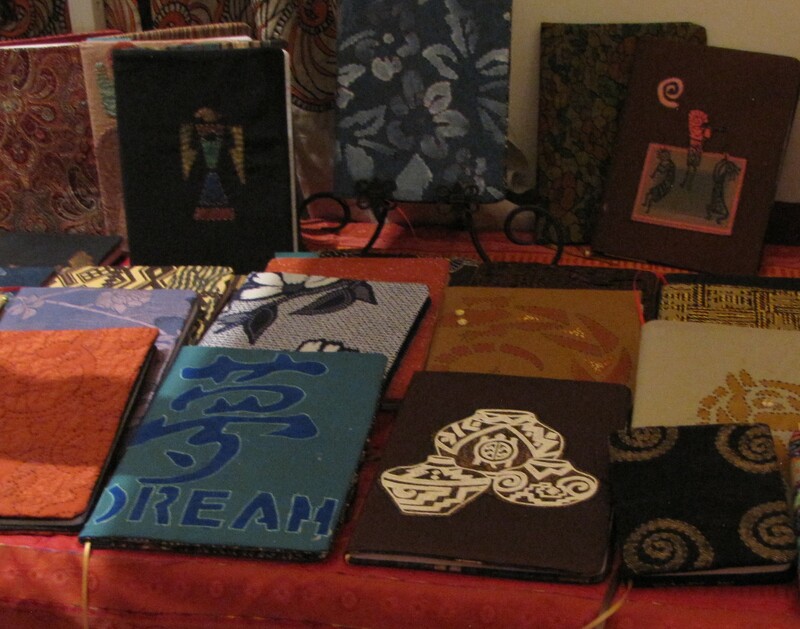 Phoenix Eco-Sustainable Fashions: I just love home made books, journals, and diaries. Especially with cloth covers and bindings. You can catch the facebook page HERE. Contact Info: Thalia Gibbs-Jackson, (505) 629-7308, P.O. Box 362, Santa Fe, NM. UpCycled Fashion and Art for the Heart: These two had a booth together. 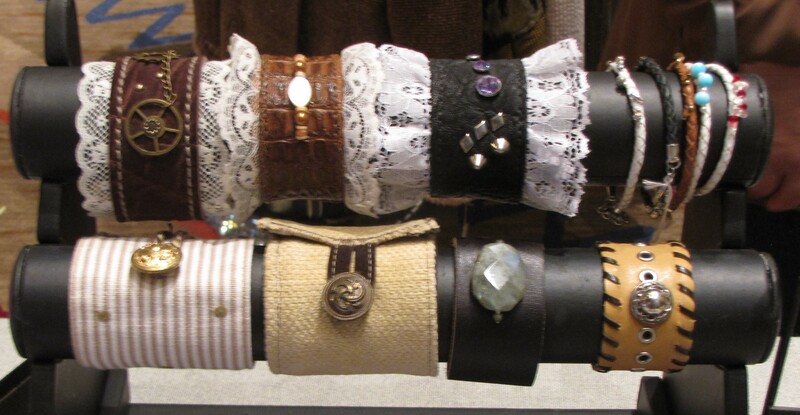 I had the joy of discovering UpCycled Fashion at the 2013 Rag Rug Festival and was pleased to see them again. This time, not only did they have their goats, but also steampunk attire (check out their fancy bracelets) and tooth fairy pillows. 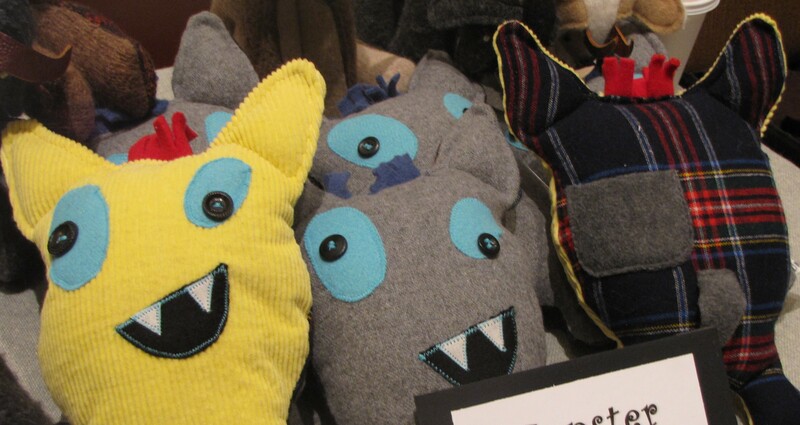 See the little pocket in the back of the little monsters where a kid can hide her tooth? So inventive! Contact Info: Jean Nichols, Project Coordinator Art for the Heart, PO Box 237, 14197 St. Rd. 75, Peñasco, NM 87553, 575-587-0202 (Home/Office), 575-587-2889 (Studio: Thursday – Sunday, 11am – 5pm), jean@upcycledfashion.com. Anita Marie Moss, Director UpCycledFashion.com, PO Box 364, Mora, NM 87732, 575-387-2308, anitamarie@upcycledfashion.com. 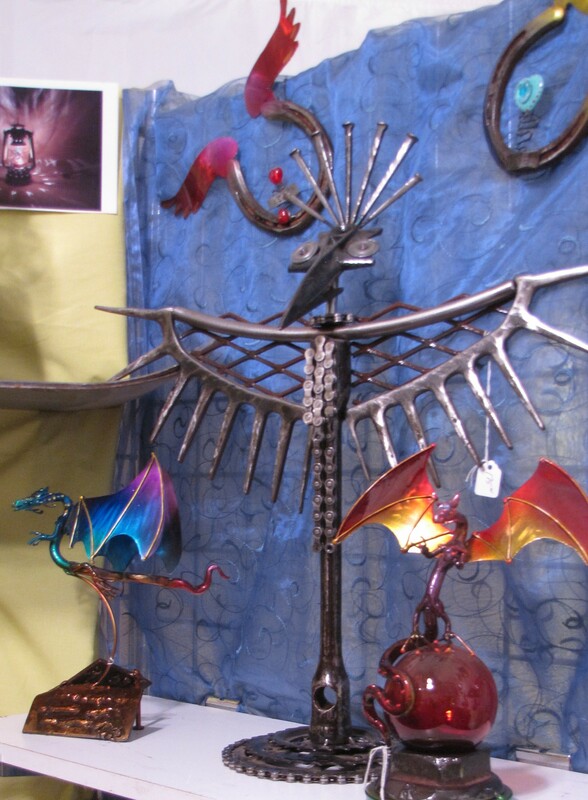 Candelaria’s Art – a few dragons, a winged horseshoe, and perhaps a Thunderbird? Candelaria’s Art: I have a thing for dragons, and Candelaria’s Art delivered. 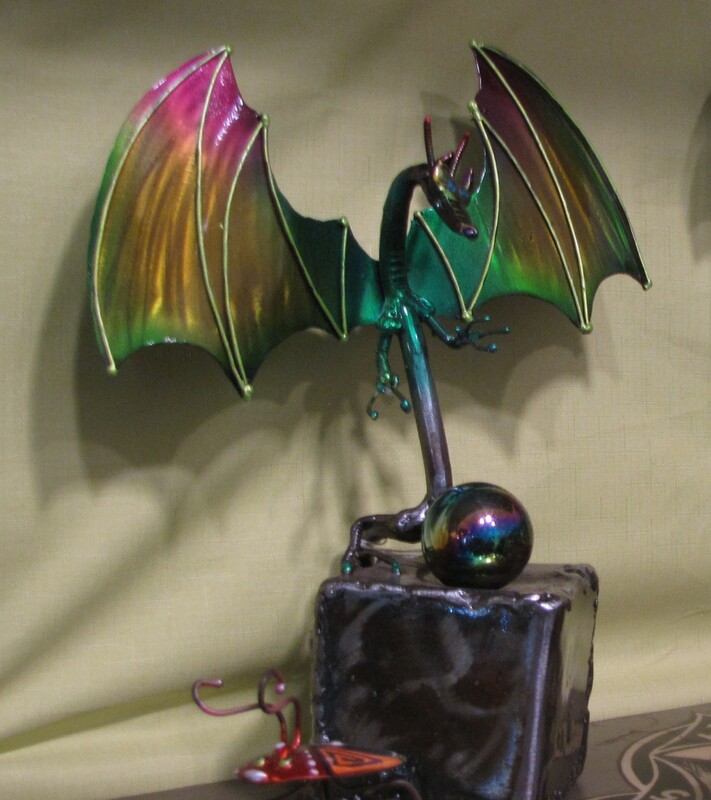 In fact, I may be sharing these dragon pics on my other sites because they are so darn cool! 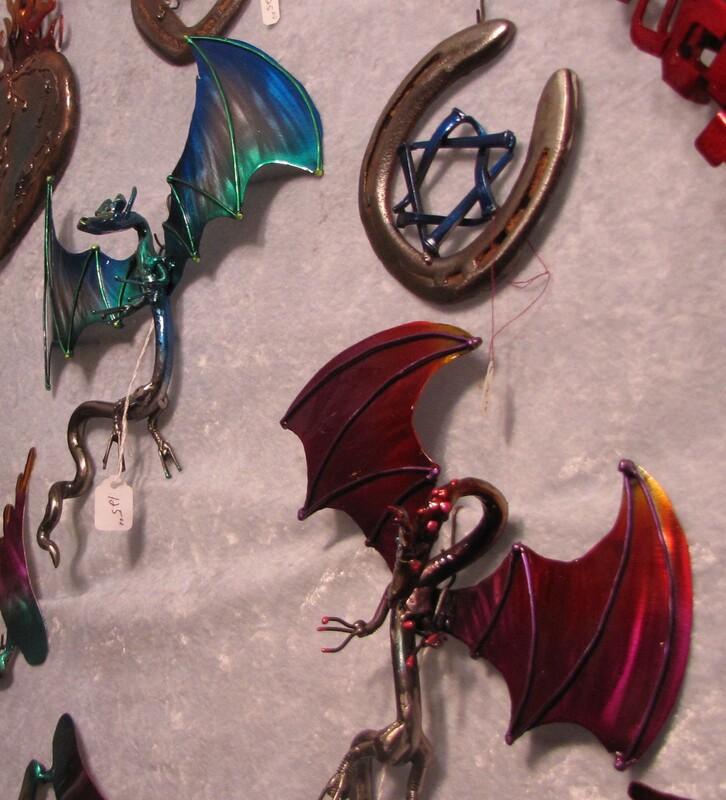 There are the larger, free standing dragons, smaller dragons with their crystal balls, and wall dragons. There was also this big metal bird, perhaps a Thunderbird. 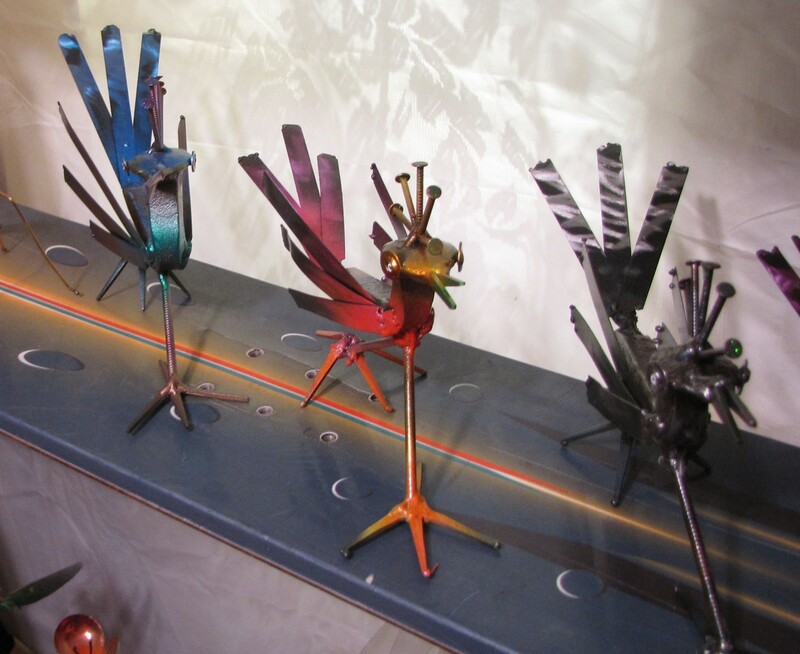 Oh, and they have little roadrunners with nails sticking out of their heads! 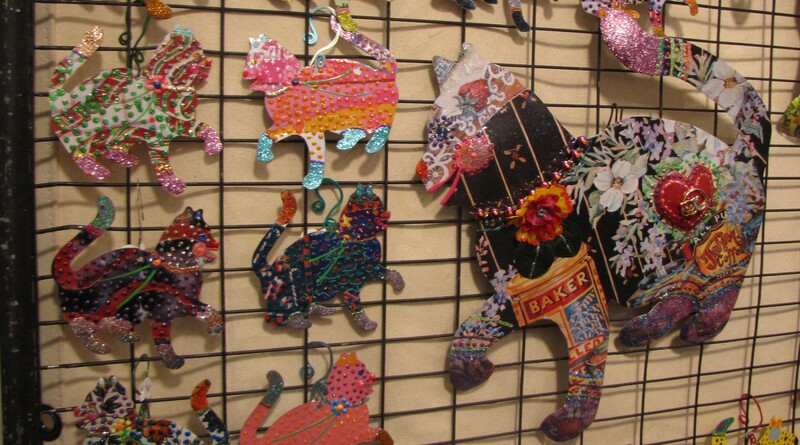 Fanciful and beautiful metal art! Find Candelaria’s Art on Custom Made and on Etsy. Contact Info: Gilbert Candelaria, gilbert@candelariasart.com. 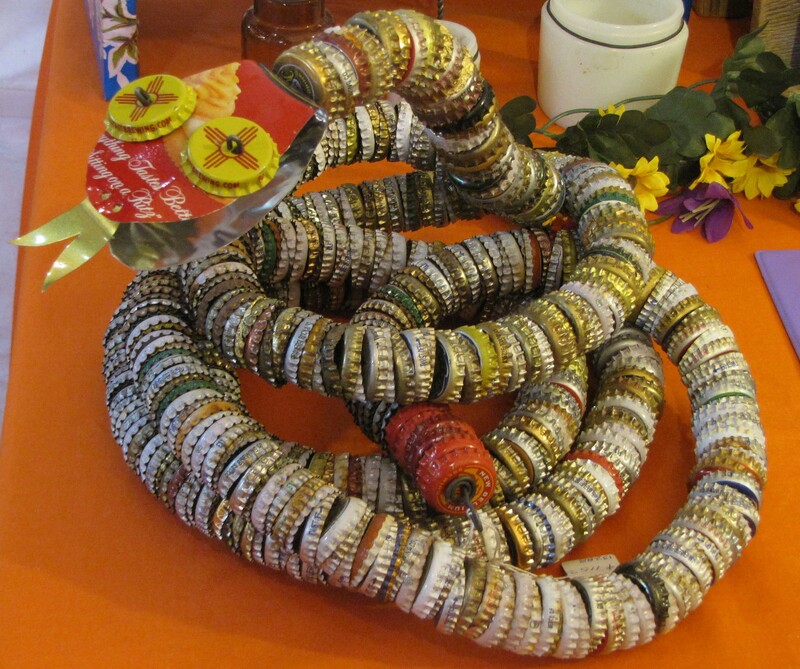 Kathleen O’Neill, metal worker: Now I know what to do with all my tea tins – give them to a metal worker! This was one of the most colorful booths in the show, as you can see from the cats and the birds. And so many different sizes! 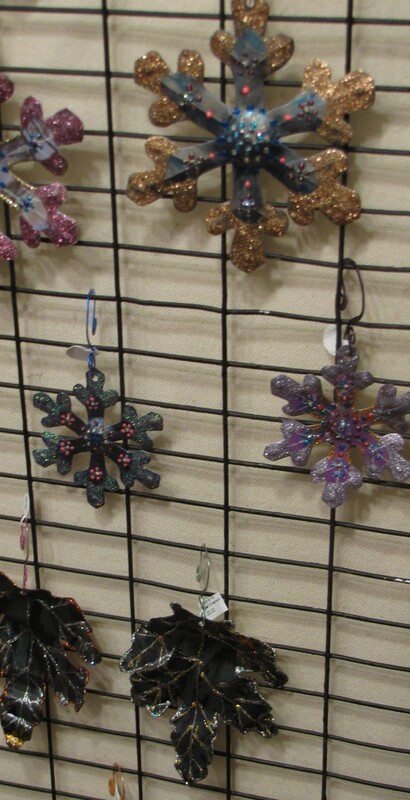 I especially liked the holiday ornaments in their simplicity. Contact Info: Kathleen O’Neill, 505-757-6802, 194 SR 50, Glorieta, NM 87535. Julia Cizeski, paper artist: Wow! I was terribly impressed with these owls. I took a picture of the back of the largest owl as I wanted to show the detail in the wings. 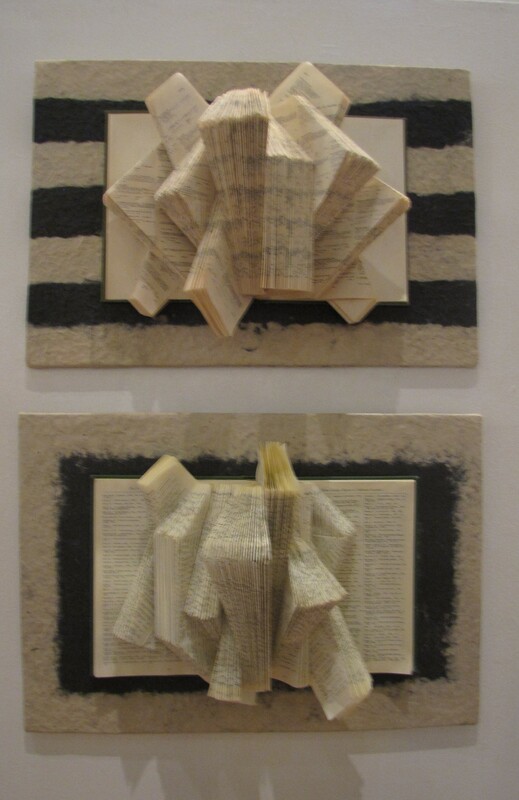 Julia Cizeski uses a variety of paper media including cigarettes, holiday paper, and paper bags. Natural dyes are used to add color where needed. 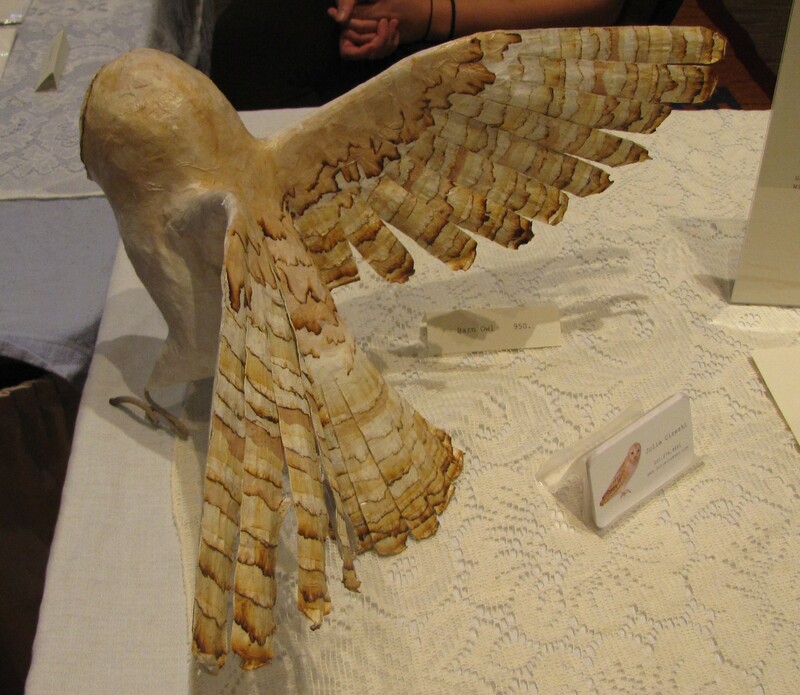 It much take hours to create even one of the small owls. Julia shares a Stop Motion facebook site with Katie Hall which you can see HERE. Contact Info: Julia Cizeski, juliacizeski@gmail.com. 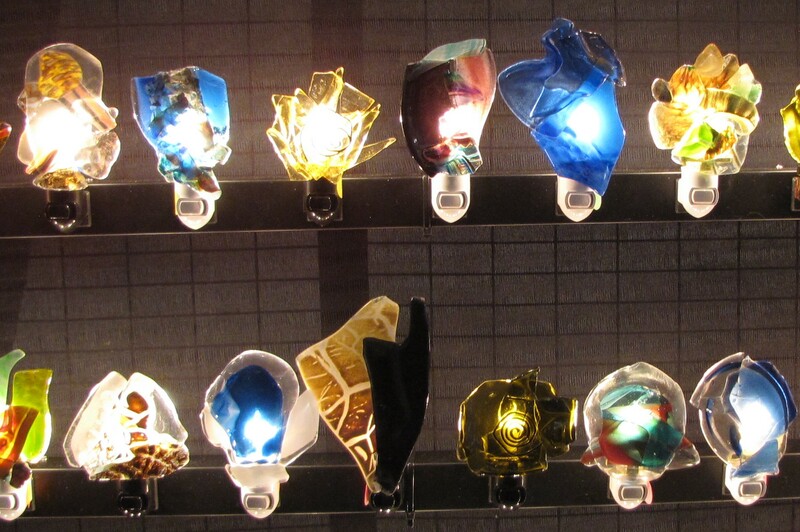 MCM Artworks: Here are some beautifully made glass nightlights made from recycled glass. So many different colors and shapes! While I could not find a website for MCM Artworks, Melody’s art can be seen at the Arts Prescott Gallery. Contact Info: Melody McConaughy, 928-533-1182, P. O. Box 3424, 2314 Thumb Butte Road, Prescott, AZ 86302, mcmartworks@msn.com. UBZ Artwork: this booth was almost empty by the time I discovered it! 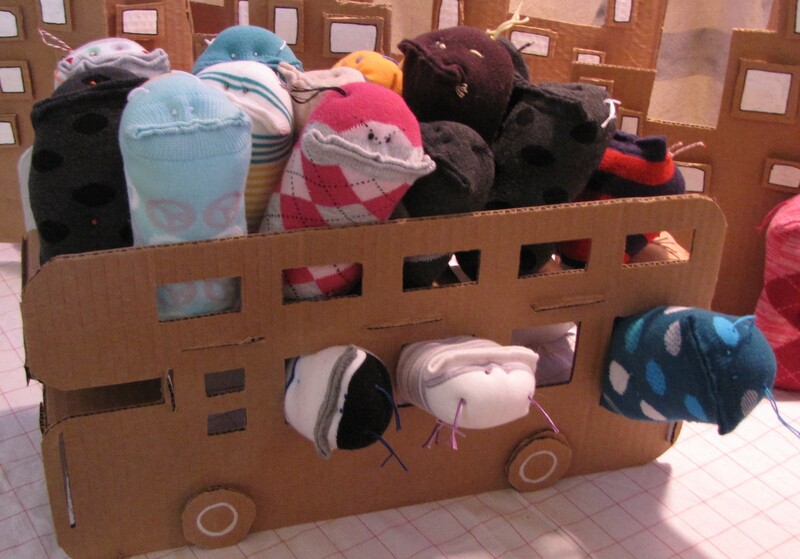 Galen Wales art had been so well received and I am glad I had a chance to snap this pic of these sock people crammed into a cardboard bus. So funny! 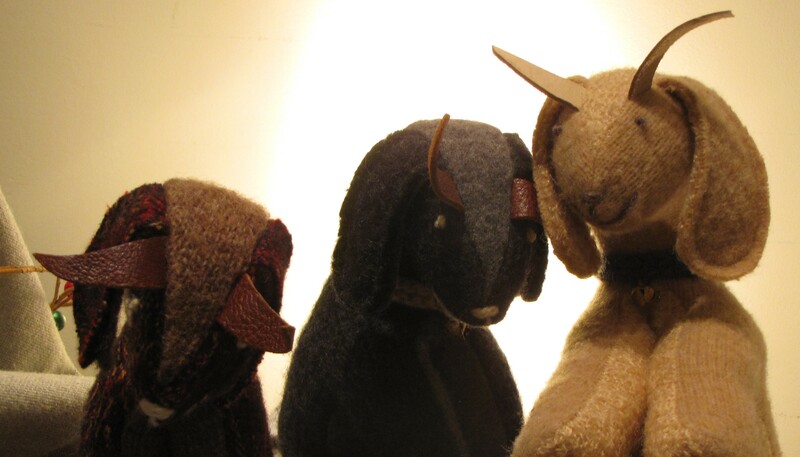 Some of the faces on the sock people make me think of disgruntled commuters and they made me giggle inside. Contact Info: Galen Wales, galen@myubz.com. Moe’s Eco Mats: Moe and his wife were the only other weavers at the show that I saw and it was treat to talk shop with Moe. Not only was he making some beautiful cloth dishtowels, he was also making these very colorful plastic mats, like you would use on the dinner table. Contact Info: Moe Sherman, 720-289-7027, moe@moes-ecomats.com. Imperfection, LLC: This lovely couple was across the aisle from us, so we had plenty of time to chit chat with them and admire their artwork. There were lots of metal workers at this show, but these two did heavy metal work. 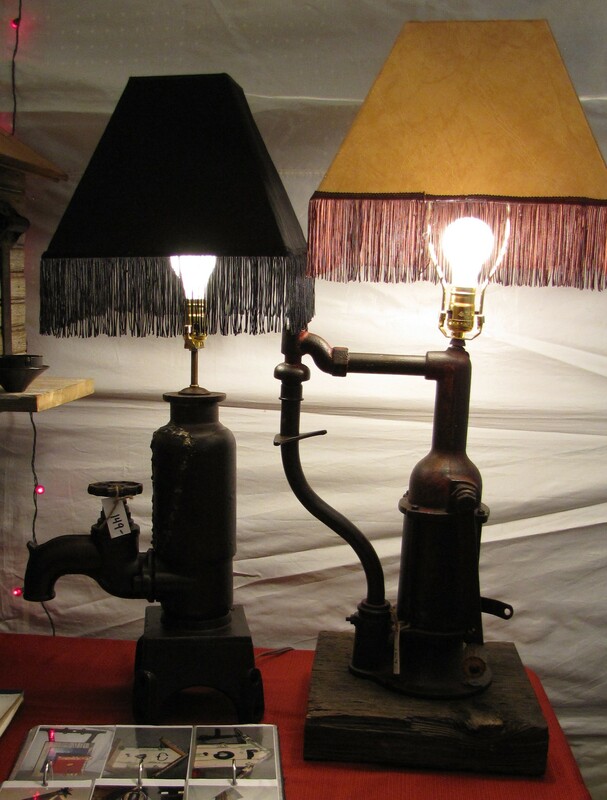 Some of these metal pieces are larger than me (like the carhorn lamp). So many of these pieces would be great for patio art. I couldn’t find a website for these two, but here is there Contact Info: Dave & Rita Park, 719-749-2472, rd7275@yahoo.com. And, of course, there was wall art and free-standing art pieces through out the show. I hope you have enjoyed the picture tour! 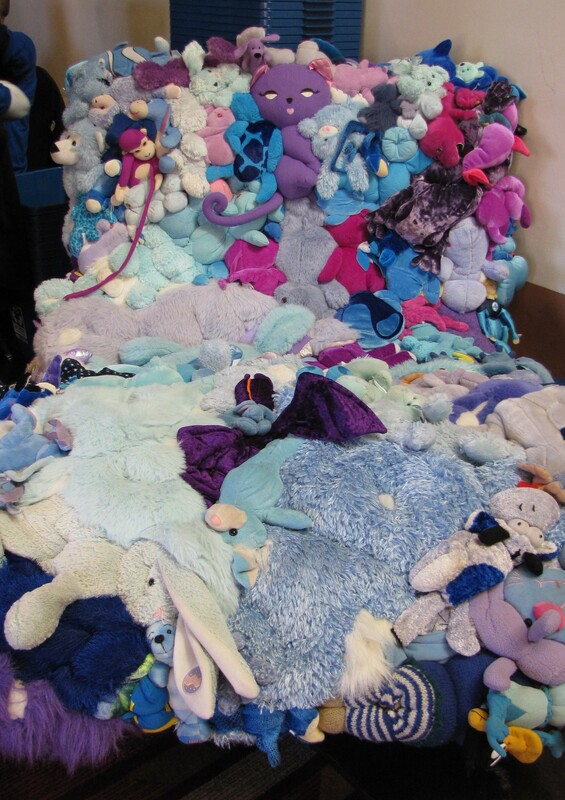 Unfortunately, I didn’t get the artist for this stuffed animal futon. A dragon and his ball, by Candelaria’s Art. Wall dragons by Candelaria’s Art.